What better way to ward off the seasonal chill than by knitting roses. 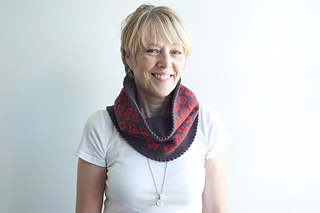 Lavalie’s Garden is a stockinette cowl worked in the round, vertically, as an enclosed loop with picot trim edges. 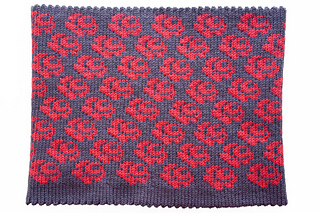 Vintage roses of 2 stranded colorwork decorate its outside surface, with background color continuing on to the inside self-lining. A slight shift in needle size keeps stitch tensions between its 2 color and single color stockinette in sync. • Flowers (CC): winesap; 1 skein, or for comparable yarn approximately 150 yds / 140 m.
Provisional cast on, circular knitting, stranded colorwork, decreasing (k2tog), increasing (yo), grafting, and blocking. 4 page pdf includes pattern instructions, photographs, rose color pattern chart, links for online instructions, and definitions for relevant abbreviations.